Is a NEW car concept and not just one more car. This was the leading conseptual criterion for the creation of the car. To be unique, to stand out from all cars and in this way to also make the driver / owner feel unique and special. The special appearance, the driving pleasure and it’s leading torsional rigidity, challenge you to acquire it.. The timeless Military design keeps it always up to date. It’s design allows various alterations, depending on the customer’s desires for customization. It belongs to an entirely different sphere, in relation to everyday cars. 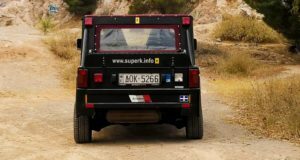 The special appearance, in combination with the limited number of cars to be produced, classifies KERABOSS SUPER K to the category of Limited Edition cars. 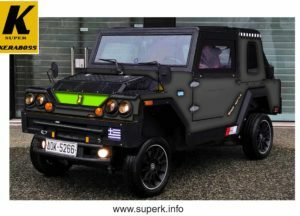 KERABOSS SUPER K, uses the latest European technology and Eco mechanical and electronic parts.